Slurp. The Share a Coke promotion is totally quenching thirsts of consumers, with a 19% lift in sales for 20-ounce bottles year-over-year. That’s a lot of coke sharing. Surprise, surprise that wasn’t it because if you played along, JetBlue rewarded each act of generosity with two free, round-trip tickets. According to FastCoCreate, 150 people used the machine and about 70% decided to share their soda with a stranger. Given the success of this campaign, it’s no surprise that they keep coming up with other executions. Another recent extension included a partnership with Google. 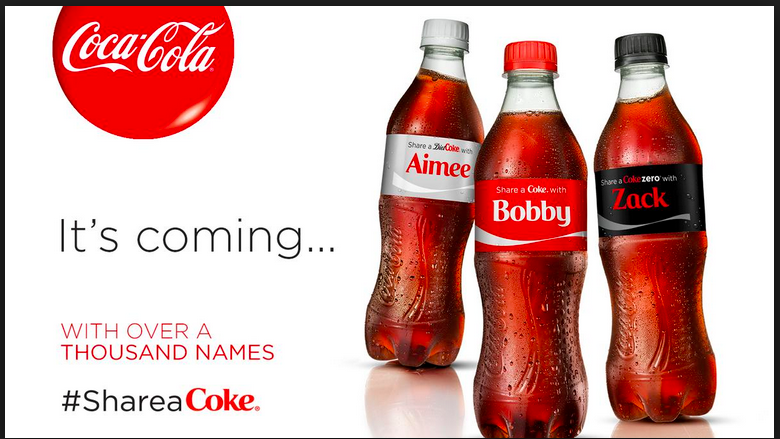 The digital “What’s in a Name?” feature asked users to name drop and add a theme like “adventurer.” A virtual bottle would then appear with the name and a stream of facts about that name. However, everything isn’t all sunshine for the soda maker. The Diet Coke brand seems to be turning into a can of worms since their sales dropped 7% in the second quarter. Execs have to be seeing red because this slide has allowed Pepsi-Cola to pass Diet -Coke and become the number two best-selling soda brand in the US. While Coke is having success due to the “Share” campaign, it’s really surprising the Diet Coke – also a part of this campaign – is giving a bad name to the brand overall. I guess the diet side really needs to find it’s genie in a bottle. I think overall this is a really cool campaign that’s effective because it borrows direct response techniques and appeals to people directly. But I think after a while having a drink with your name literally on it will start to feel stale, so they should think about canning this for something fresher soon.